As of Jan. 23, all officers in Washington will be issuing tickets for any driver found using an electronic device while operating a vehicle. The grace period for Washington’s new distracted-driving law is over. As of Tuesday, six months from when the law went into effect, all officers can ticket drivers found using any electronic device — including cellphones, tablets, laptop computers and personal gaming systems — while behind the wheel. The fine is $136 for a first offense and rises to $234 for a second offense within five years. The Driving Under the Influence of Electronics Act prohibits even holding gadgets at a stop sign or red-light signal. Motorists can still use a smartphone mounted in a dashboard cradle but not to watch a video. Calls to 911 or other emergency services and calls between transit employees and dispatchers are allowed. The idea is to limit technology use to a single touch, for instance pushing to answer a call or launching a navigation app, said Sgt. Rob Kramp of the King County Target Zero Task Force, a traffic-safety coalition. While some law-enforcement agencies have been ticketing offenders for months, others allowed a six-month grace period in which they issued warnings to educate drivers about the law. 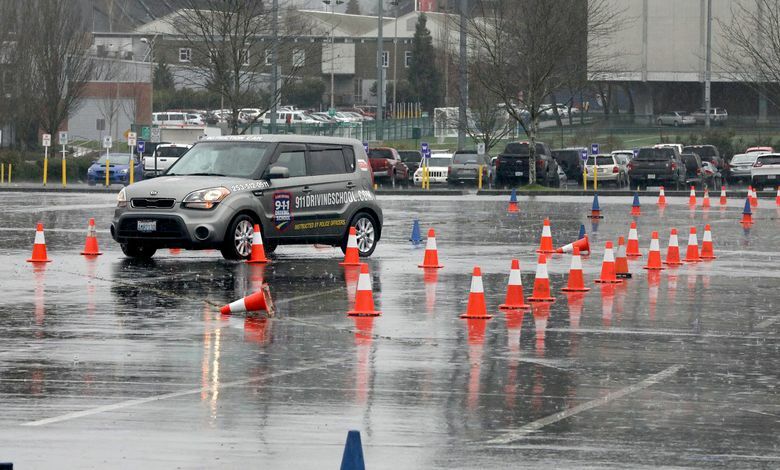 To illustrate the danger involved in distracted driving, the Washington Traffic Safety Commission and Washington State Patrol invited teenagers to travel through obstacles while experiencing common distractions: texting, talking on the phone, distracting passengers. 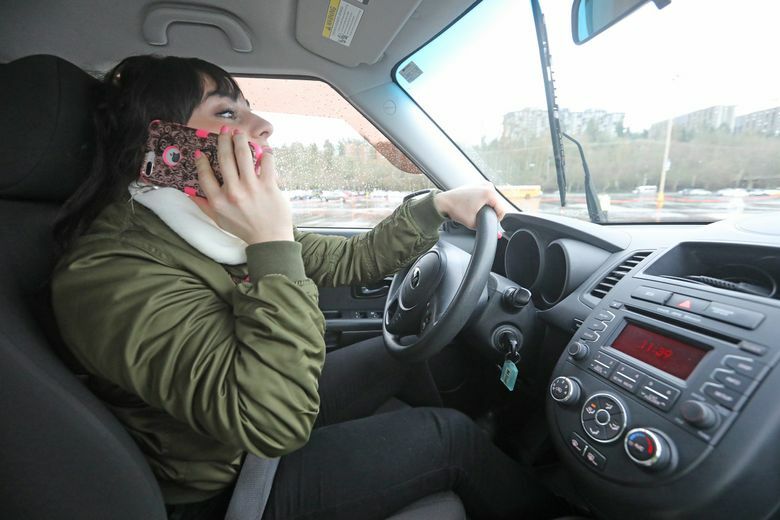 Anisa Ashabi, a 19-year-old student at Washington State University, was one of the participants in the distracted-driving course. She admits the temptation to want to lean over and check a text message. “If you want to change the song or switch to a different playlist, a lot of times I think, ‘OK, I can just do it really quickly,’ but I know it’s not safe,” Ashabi said. Throughout the course, which entailed weaving in between cones, switching lanes, turning sharp corners, averting a collision and back-in parking, officers sent Ashabi several questions through text message. She had to calculate math questions, answer inquiries about her last meal and recall family history while maneuvering through the setup. She hit four cones during her trip. Ashabi’s mother, Elizabeth Dourley, who attended the event with her, said she worries about her daughter’s safety on the road. In 2015, 3,477 people nationwide were killed in distracted-driving incidents, according to the National Highway Traffic Safety Administration. Younger drivers are the most vulnerable age group for distracted driving. A 2013 study found that 27 percent of the distracted drivers in fatal crashes were 20 to 29 years old. Teens between the ages of 15 and 19 followed with 10 percent. While all age groups engage in distracted driving, the state is targeting younger drivers with an educational campaign before unsafe habits form. “This generation of millennials are more adapted to technology and so much more connected all the time, so it’s easier to get distracted,” said Alex Zahajko, another participant in the exercise. Zahajko, 17, said the event put into perspective how easily distraction can happen. The most surprising take-away was how dangerous talking on a cellphone can be. “Even when yours eyes are on the road, you can be mentally not paying attention,” he said. The simulation course, held in partnership with 911 Driving School, also serves as an educational opportunity and reminder of the new law. Gov. Jay Inslee vetoed a compromise in the state Legislature this past year that would have pushed the law’s implementation to 2019. Some law-enforcement agencies began handing out tickets this past year, but as of Jan. 23, all officers in Washington will be issuing tickets for distracted driving. Between July, when the law went into effect, and the end of 2017, 6,475 drivers had been cited statewide, said Captain Ron Mead of the Washington State Patrol. An additional 746 motorists have been ticketed since Jan. 1. 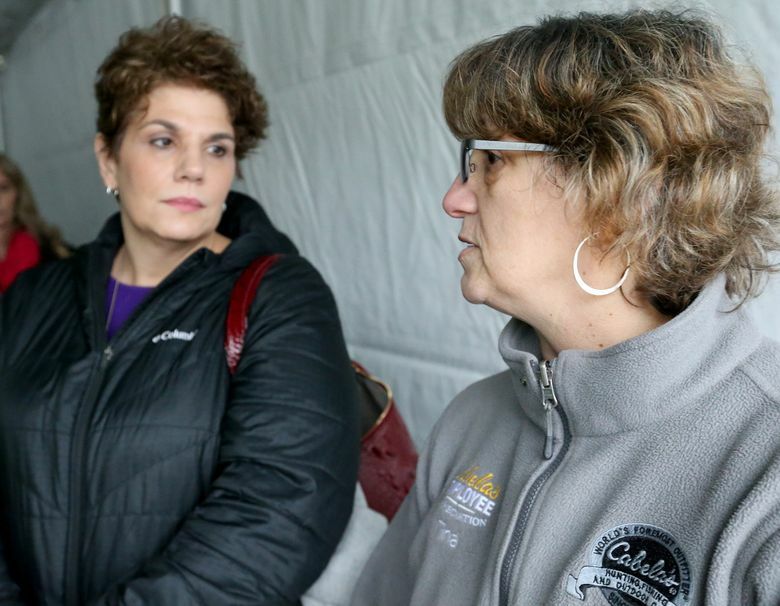 Gina Bagnariol-Benevides, whose sister, Jody, died in a distracted-driving accident, and Tina Meyer, whose son, Cody, was struck by a distracted driver, helped get the bill through the Legislature. They were on hand for Tuesday’s distracted-driving demonstration. “The traffic-safety commission wants a future where putting your cellphone out of reach when you drive is as prevalent as putting on your seat belt,” said Washington Traffic Safety Commission Director Darrin Grondel. Correction: A previous version of this story misstated the fine for a second distracted-driving citation within five years. It is $234.